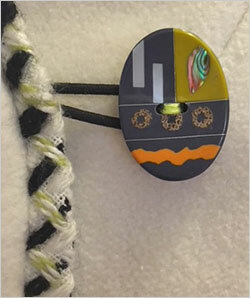 Notes: Diane started sewing at AAF as a teenager in the early 70's. Ater a lengthy hiatus, it was a nice surprise to reconnect with her! And, It was a real adventure to have her return to sewing this past summer for a long term visit and undertake a major sewing project. 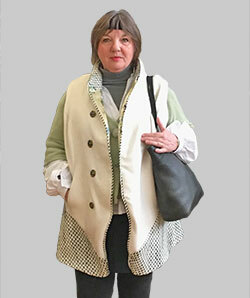 Diane lives in Germany and brought along a white wool coat that she converted to a modern vest! 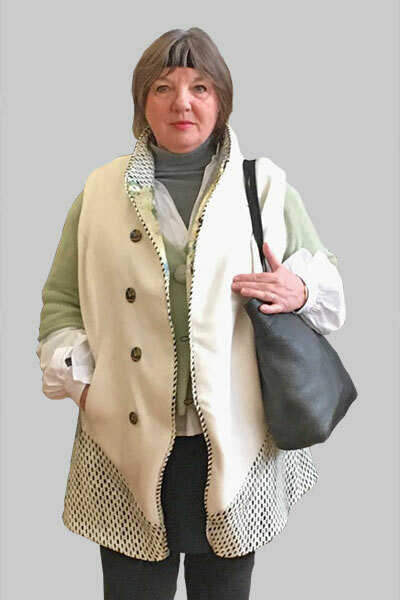 She took apart and recut the original coat adding an AAF tweed fabric for the inside collar, diagonal panels and piping. 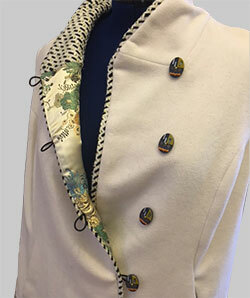 She used a beautiful Japanese silk jacquard for the lining and chose some spectacular AAf buttons as the finishing touch. We all applaud Diane's vision and the completion of her project. And look forward to another visit and sewing adventure!